Our grandmothers grew them as did their grandmothers, and now it's our turn to find a space in the garden for this old-fashioned cottage garden plant. When I think of nasturtiums, images of hollyhocks, garden pinks and other old fashion garden plants come to mind. Over the years, my favorite nasturtiums have included the cherry and lemon yellow colored ones, in addition to the Alaska Series that recently found a place in my garden beds. Grown in gardens for centuries, nasturtiums originally came from Peru. Introduced to Spain during the sixteenth century, this herb now grows worldwide and has naturalized in many areas. We can thank the Spanish conquistadors for adding zest to our salads and a wonderful, easy to grow plant to our gardens! Here in the Northwest we can grow some of the perennial tropaeolums as well as the popular and much loved annuals. 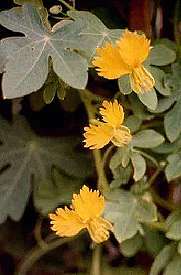 A favorite cottage garden plant, Tropaeolum majus reminds me of the old-fashioned gardens I knew as a child. This annual, used for many reasons, always finds a place in my gardens. In the flower garden it can't be beat. Easy to start from seed, nasturtiums grow quickly. 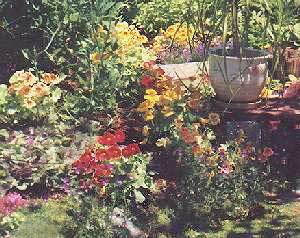 The annual plant is good to use for filler in a new garden while the perennials take their time being established. You can use nasturtiums as a climber along a fence or trailing down in a container. Bushy cultivars can add a riot of color without taking up too much space. Nasturtiums are great plants to help introduce children to gardening. The seeds are easy for them to hold and plant. They sprout quickly and are easy for the kids to identify as small seedlings. If children like the taste of its peppery leaves or bright flowers, they can browse their nasturtium patch whenever they like. The round leaves, looking like little parasols, add fun to a salad, and the kids can help Mom or Dad with harvesting salad makings. When my child was young, she thought it was a very special plant. Alas, as a teenager, she now turns up her nose at them. Nasturtiums are a great salad herb, and as a bonus are very high in vitamin C. I use the leaves of my favorite cultivar, Tropaeolum 'Alaska Series', in salads and in sandwiches. The flowers sometime go into salads, but I also like to freeze them with water and other edible flowers in Jell-O rings to add to punches. The seeds can be used for capers, although I have not tried them. Nasturtiums add another dimension to the garden by being a beneficial plant. Hummingbirds and bees visit the blossoms for nectar—for that benefit alone I would grow it. I use nasturtiums to attract black aphids, which keeps the aphids away from other plants. My nasturtiums take it in stride and by mid summer, the aphids disappear. The Alaska Series, so far in my gardens, have not attracted black aphids. 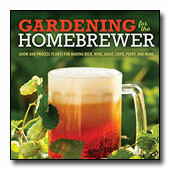 This makes it great to use for salads, while other nasturtiums act as a trap for the bugs. After a few years, my last garden saw less of the aphid problem, after years of organic gardening. My new gardens still need a better balance with beneficial insects, so the aphid problem is back. Annual nasturtiums are easy to start from seed. I usually sow my seeds around the average last frost date. You can plant seeds a few weeks earlier but in my experience, it doesn't seem to make much difference. Direct sow into well-drained soil in a position with full sun. 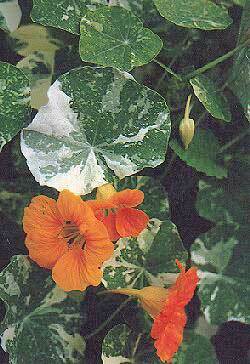 As a side note, nasturtiums also grow for me in light or dappled shade, resulting in larger leaves and fewer flowers. The Alaska Series does well in light shade, and I don't mind the loss of flowers since I grow it mainly for the variegated foliage. Nasturtiums flower from summer until first frost, when they turn into a black gooey mess. Before frost, I take the ripened seed and toss it around the bed for next year's plants. The following year, I thin out any seedlings spaced too close together. If I transplant them when the plant is quite small, I have successfully moved them to other locations. Once they have 3 to 4 sets of leaves, they don't transplant well in my experience. Once established, nasturtiums will reseed and come back every year. Canary creeper or canary bird flower, as it's often called, is a perennial that is treated as an annual in zones colder than USDA zones 9-11. Tropaeolum peregrinum is another native of Peru and Ecuador. Not hardy in most parts of the Northwest, it will winter over during a mild winter or in a cool greenhouse. I grow this next to the deck on the east side of my home quite successfully. If you can grow canary bird flower you will have a beautiful plant. The five-lobed leaves are quite different from the annual varieties in shape as well as color. The gray-green to bluish leaves are lush looking on their own; add the canary yellow flowers and it is worth a try to grow. It blooms from summer to autumn and grows 8 - 12 feet high. I like the tropical and exotic look of this plant.